In a world where power tools rule, hand planes still offer the chance to boost quality in a way you might not realize. No matter how good power tools get, there will always be jobs where a well-tuned hand plane is the best option. Drum-tight joints in stain-grade trim, hand-beveled raised panel doors, or hand-planed solid wood cabinet parts and fireplace mantles – in cases like these you can’t do better than a razor-sharp hand plane. Build a collection of a few good planes, learn to keep them sharp and they’ll improve your woodworking results forever. As long as the world still has electrical outlets, hand planes will never replace power tools. That’s fine. But a good plane can still supplement electric tools in ways that makes your work stand out. The thing is, it’s easy to waste your time with a bad hand plane. Most modern ones are junk. If you’re new to planes, consider starting with a block plane. Plan to spend at least $75 to $100 on a good block plane because anything cheaper will probably cause you frustration. I rarely see a decent hand plane for sale in a hardware store any more (they’re made too cheaply), so I wouldn’t hold out much hope there. Planes built before WWII are almost universally good, but it’s not always easy to tell how old a plane is at a garage sale or second-hand store. Some of the best new hand planes in the world are made in Canada by Veritas Tools. I own several of their planes and they’re great. My favourite block plane has a low-angle design with the blade set about 12º from horizontal. 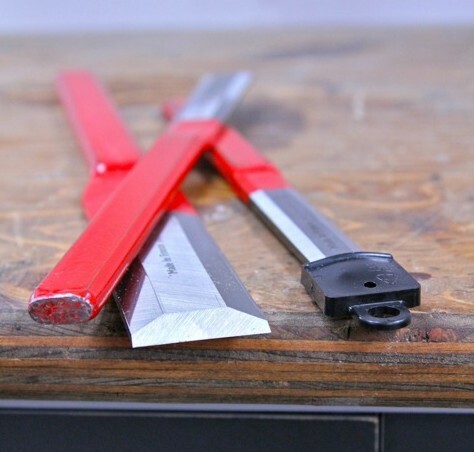 This creates a very shallow slicing action that’s ideal for trimming the kind of end grain surfaces you’ll be dealing with as you bring trim joints together. 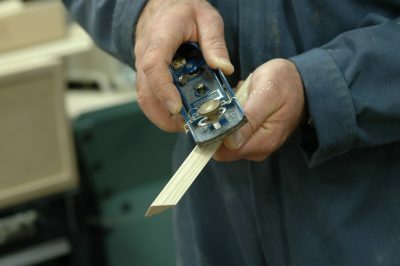 As wide, stain-grade trim becomes more and more popular in homes, the usefulness of a low-angle block plane increases. It’s the tool of choice for finessing trim and molding joints together when latex caulking isn’t an option because paint can’t be used to hide the mess. When it comes to stained trim, you either get the joint right or wrong. There is no forgiveness. Before you write all this hand plane stuff off as the wishful thinking of a guy trapped in a time warp, think again. More than once a few swipes with a hand plan have made all the difference, even on the modern, fast-paced job sites I’ve worked on. And it’s not just about installing better trim, either. In a world where so many factory-made frame and panel cabinet and vanity doors all look like they came rolling off the same conveyor belt, a hand plane offers a quiet and simple alternative. And it all comes down to beveling the edges of raised panels by hand, instead of the usual router table or shaper-cut profiles. Sounds slow and labour-intensive, I know, but it isn’t. It’s actually fun. All frame and panel designs offer two things. First, they look terrific because of the texture and visual variety they present. But they also limit the troublesome seasonal movement that’s the hallmark of all wide expanses of solid wood. The inner panel gets larger and smaller with changes in humidity, while the outer frame remains more or less the same size. Building your own hand-beveled frame and panel doors does all this in a format that looks way more classic than anything available off the shelf. Frame and panel work always begins with the horizontal and vertical members of the door frame. These are called stiles and rails. You can use biscuits or dowels to connect these parts. Even pocket screws do just fine if you’re making raised panel wainscoting that’s destined to be installed permanently against a wall. When it comes time to making your raised panels, there’s a timesaving trick. Your plane doesn’t actually cut most of the bevel. 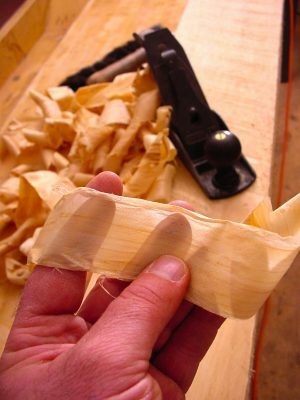 Instead, use a tablesaw to hog off most of the waste with the blade tilted 15º to 20º from plumb. The plane comes into use afterwards for removing the saw marks while making the bevels all a consistent width and thickness. Keep trying one of your grooved frame members periodically on the edges of the panel as you plane. The idea is to adjust the thickness of the bevel’s edge so it plugs nicely into the stile and rail grooves you prepared earlier. To help you get bevel width perfectly consistent, use a combination square and pencil to mark a line some consistent distance in around the perimeter of the panel. 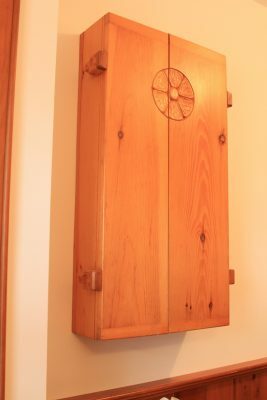 A 2-inch wide bevel is ideal for most cabinet doors. Expect to pay about $200 for the kind of smoothing plane that’s ideal for raised panel work. Watch the video at the end of this article to see how raised panels can be shaped by hand. It’ll all be very clear after you see things in action. If you really want to look like an old-world master, consider using a hand plane for smoothing solid wood cabinet sides or fireplace mantles. That’s right, no sanding just a hand planed surface as a final step. I built the cabinet you see here back in the mid-1980s with hand tools only, including the use of a plane for final smoothing of the rough white pine lumber I was using. The subtle undulations left behind by a slightly curved blade is a hallmark of traditional woodwork and much appreciated in a world where too much is accomplished by machine. Hand planing like this goes surprisingly quickly, too. It takes less than half an hour to hand plane a rough-cut 4×10 pine mantle that’s eight-feet long. That’s twenty bucks of labour time to create a one-of-a-kind home feature that can easily be sold for several hundred dollars if you wanted to start a little sideline business. Although you can use a smoothing plane for this kind of surface work, a scrub plane is better. It has a slightly curved blade that creates subtle and unmistakable undulations in the wood surface. You can get a good scrub plane for about $150. By now I hope you’re eager to give this hand-plane thing a good try because it really is worthwhile. But there’s one more thing you need to know first. A razor-sharp blade is absolutely essential. And I mean razor-sharp, as in sharp enough to shave hair cleanly. That’s how you get paper-thin shavings like the one you see here. Without an ultra-sharp blade nothing happens. 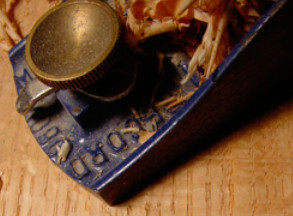 The good news is that sharpening needn’t be the pain you probably have experienced it to be. Not if you have the right sharpening equipment, that is. 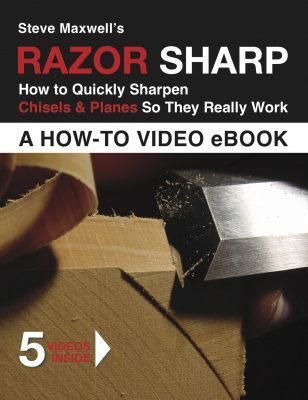 There are two requirements behind every sharp edge: a correct bevel angle of 25 to 30 degrees at the tip of the plane blade, and a finely honed edge that’s capable of cleanly shaving arm hair or slicing curls of end-grain from softwood test blocks. Sharpening a plane iron (or any edge tool) is a product of these two steps: grinding (doesn’t need to happen often) and honing (needs to happen often). 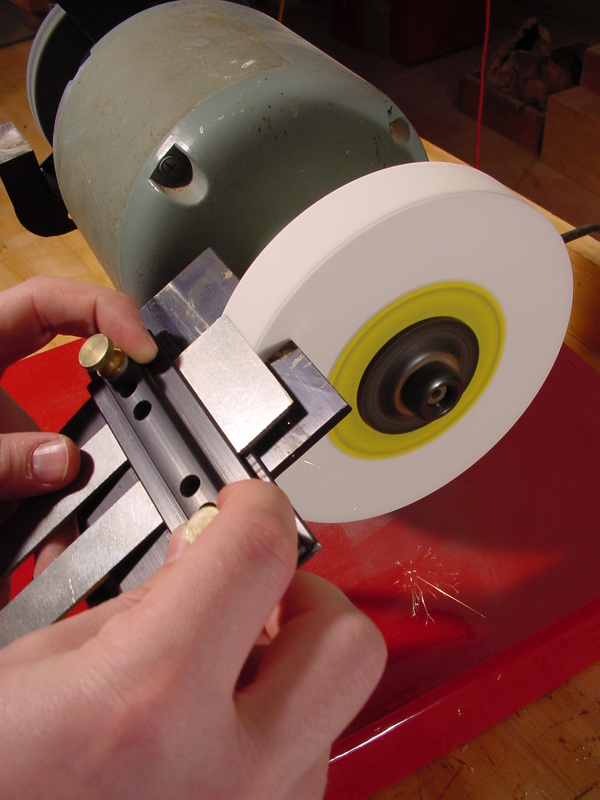 If your plane is brand-new, you can probably skip the first sharpening step altogether – the grinding. Top-quality, factory-fresh planes are always ground correctly. But let’s say you’re dealing with an old plane iron that’s seen lots of brutal action, perhaps even opening paint cans or stripping furniture. Successfully grinding a plane iron like this demands the same things needed for reworking the business-end of any edge tool. You’ll need a stationary grinder with a tool rest capable of supporting the plane iron securely while reshaping its surface with minimal heat built up. That’s my setup in the photo below. 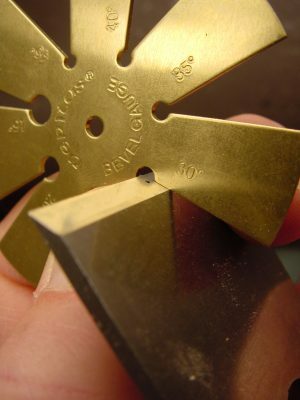 Understand right now that heat is the enemy of every edge tool. If your plane iron becomes yellow or blue at the tip because of grinding heat, it will never hold an edge properly again. At least not until it gets re-tempered by someone expert at working high-carbon steel. Here’s another thing . . . When it comes to tool grinding machinery, you’ll find more than a few wet grinders that can do a great job for you. Trouble is, they’re usually way more money than what you can justify for occasional tool grinding. And make no mistake, grinding doesn’t have to happen all that often. The good news is that an ordinary, inexpensive bench grinder can do a great job preparing plane irons, as long as you upgrade the tool rest and the grinding wheel. A generous size, easy bevel angle control, and a sliding tool holder are all features you’ll find on good tool rests. While you’re thinking about your grinder, you should consider is a cool-running, soft-bond wheel. Except for their white color, these look the same as regular grinding wheels. But the softer consistency means that fresh, sharp abrasive particles are continually being exposed while grinding. These remove tool steel with less friction than the old, rounded particles that develop on traditional wheels. The result is a cooler grind, though the cool wheels do have a somewhat shorter working life. But even with a cool-grind wheel on your side, you still need to be careful. Don’t make sparks for more than two or three seconds before dipping the tip of the iron in cold water for five seconds. Keep the grinding and cooling process going until the entire bevel shows an even, fresh surface, with a small burr of rough metal formed at the tip. Honing comes next, but don’t worry. This is the fun part. Although I have an entire collection of Japanese water stones in my shop, I almost never use them because I’ve discovered something much, much faster. Instead of stones, I go directly from the grinder to a hard felt buffing wheel charged with a chromium oxide abrasive compound. All it takes is two minutes to impart a scary-sharp edge on any freshly ground plane iron. And buffing a slightly dull edge back to exquisite sharpness takes even less time. Just hold the edge of the plane iron tangent to the wheel as it spins, with the tip pointing in the same direction as wheel rotation. Buff the back surface first, then the bevel. When the surface shines like a mirror, you’re done. As I mentioned before, buffing is the only way I hone my tools and it’s been like this for many years. Buffing is much faster than sharpening stones and the results are better, too. Click here to learn more about the buffing system I use. This is the same system I’ve been teaching in classroom workshops at wood shows. When carpenters forgot hand planes in favour of power equipment, they turned their back on a tool that will always have a place in the best quality work. 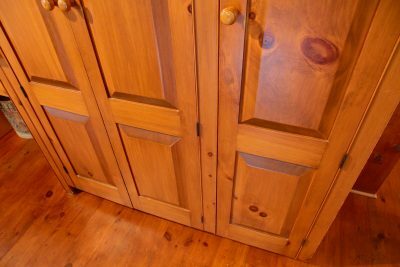 Rediscover this age-old fact and you’ll vault your work to levels that will turn heads long after the last piece of woodwork goes out your shop door. Click below to watch a video lesson on how to use a hand plane to bevel the edges of solid wood raised panels. I’ve included a transcript below the video window so you can follow more closely and learn. VIDEO TRANSCRIPT: 00:00 In this video, I want to show you a simple way for using a hand plane to make raised panels. This is a raised panel blank I’ve made up to show you. It’s got a big knothole in it, so it’s just a sample just to show you how it works. All four sides have the bevel angle rough cut on them with a table saw. The table saw, I made a jig for it that, provides a fence support on one side, and the blade is angled over maybe 18 degrees, 20 degrees from vertical, and the bevel is rough-sawn. 00:42 You can see here what it looks like. The edge of the panel is thicker than I want, and then there are some saw marks on here. So we’re getting roughly to the shape of a raised panel, but it’s not nearly refined enough, and that’s what this next step is all about. You need some sort of a bench. It doesn’t have to be a fancy one like this, but just something that’s going to hold the panel steady as you work. Now, the bevel width on this sample is fairly consistent, but it’s not unusual for that bevel width to vary. 01:23 You might have moved the panel a little bit as it’s sawing on its edge, or maybe there’s a little bit of a warp there. So the first step is to define how wide you want your bevel to be, and a combination square is a great tool for that. So I’ve already prepared the bevels on the other sides of this panel, and this combination square is set to those widths. You need something to plane to, some reference line to plane to, and in this case it’s a fair amount wider than the sawn bevel, but that’s okay because you’ll get to see how it all works. 02:12 Now, the next thing you need is a very sharp hand plane. The blade here, I’ve sharpened it using my buffing wheel system, which is by far my favorite. I’ve got a course that shows how to take a dull tool and in a couple of minutes make it sharp enough to shave hair. This plane iron is sharp enough to shave hair. So, now it’s time to smooth the bevel but also to do two other things. I’m going to be widening the bevel so it just comes to this pencil line. That’s task number one. 02:51 Task number two is to make the edge of the panel thin enough so it fully interlocks with this frame part. In this case, it’s a style. Now, right now, you see it’s too thick. It’s not going to go in as far as it needs to, so I need to make this thinner and the overall bevel wider all along the whole edge, and that’s what I’m going to show you now. I’ll have the plane set for a … medium cut. I guess the first thing I have to do is to bring the width of the bevel out where I want. 03:46 I’m not really working along the edge too much. I’ll concern myself with that later. I’m just making the bevel wider, approaching that pencil line. I don’t want the pencil line to disappear completely, so I’m going to start to work on the lower end of the bevel now. Of course, I want the bevel to be completely flat too. I don’t want it to be round, so I do have to work in the middle as well. Lift up and see how we’re doing. 04:37 You can take wood away, but you can’t put it back. So, now I’m here at this end. I’m almost as thin as I need to be. Up here at this end, I’d stay a little bit thicker. I also notice that one side of the blade was dragging a little bit, causing a little bit of a score mark. It’s not a big deal because I’m going to be sanding this too. But I’m going to use the lever here to change the angle of that blade a little bit. I made it go this way a little bit more so that this edge wouldn’t drag. 05:18 Now, as I’m getting closer to my finished dimensions, I’m going to track the blade a little bit, take some gentler cuts. Getting there. That’s about as close as I want to go with the hand plane. It’s smooth. The bevel is a consistent width. There’s a little bit of torn grain. It’s unavoidable because the grain is not consistent along the whole length of this panel. But what I’ll do now is to take a quarter sheet finishing sander. I think I’ll go at it with 180-grit paper, and we’ll refine that bevel so that it’s nice and smooth and ready to go. 07:20 Some people wonder about how you can use a hand plane on end grain. I just showed you how it works on edge grain. But if it’s sharp enough, as you can see, it works very well on end grain too. I don’t know if you can see that, but the grain is actually shimmering here. It’s so smooth, and a little bit of sanding to make it blend with the rest of the panel, and we will be ready for putting this door together.